Translation: Shiori Saito based on the idea of a structure of twisting cubes, creates this building in year 2005. Calatrava is inspired by both animals and humans and their natural movements. The vision of Turning Torso is based on a sculpture called Twisting Torso. The result is an amazing combination of sculpture and building. It is also one of the few landmarks in the world which becomes part of everyday life with its ten floors of offices, 147 luxury apartments and meeting facilities on the two top floors. 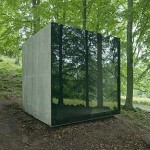 Upon completion, it was the tallest building in Scandinavia. Sweden is a truly “think green” nation. All the “new constructions” try to make it easier for the residents to be environmental friendly. In Turning Torso there is a kitchen waste disposal unit in every apartment for grinding organic waste. Also, the many shared facilities may lessen the need for car travel. The building is supplied with 100% locally produced renewable energy. This energy should of course be used efficient. By monitoring heat and water consumption in each apartment residents can plan their own energy costs and thereby their impact on the environment. 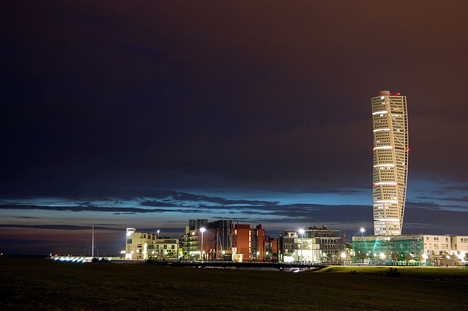 The building brings a recognizable skyline for Malmö. It´s an icon not just for Sweden but also for south of Scandinavia, as Öresund Bridge which connects the cities of Malmö and Copenhagen over the water. As Turning Torso is a private residential building there is no access for the general public.